Whether you drive a compact car, small crossover, medium SUV, or a full-size pickup truck, there is a good reason to install a trailer hitch on your vehicle, even if you’re not pulling a trailer. 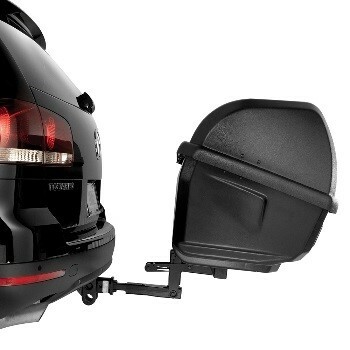 In this article, we will discuss the advantages of a rear-mounted receiver hitch for carrying cargo or sporting equipment. The hitch industry has exploded in recent years, with the tow hitch manufacturers cranking out plenty of offerings. The good news for you is that there is a greater chance than ever of finding a trailer hitch designed specifically for your year, make, and model vehicle. And let’s bust this myth that the trailer hitch must be welded to the car. False! Not only do these custom units bolt into place, most of them do not require drilling. They cleverly use openings in the existing frame or unibody for strategically placed hardware. We have done a few of these installs ourselves. A buddy is helpful (but not necessary) to lift the hitch into place. But most can be bolted into place within an hour. As you begin the shopping process, you may need to make some decisions among the choices you find. If you are NOT planning to ever pull a trailer, the “load rating” of the receiver hitch is of little or no concern. 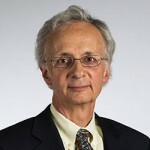 You may find, however, that you have a choice between the two most common receiver sizes: 1 ¼”, or 2”. The dimension refers to the measure of one side of the square, and these are industry standards. If both sizes are available, we recommend the 2”, as there will be more accessories to choose from. If you have a compact or subcompact, the 1 ¼” may be the only choice. Do not fret! 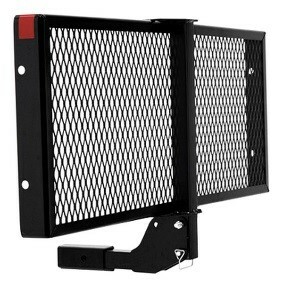 An adapter will allow use of 2” accessories in the smaller opening. Today, most of these quality units are painted or powder-coated for long-lasting good looks, and are tucked behind the bumper to avoid bruising your shins every time you walk past the car. Once you’ve purchased and installed the hitch, the real fun begins, and that is researching the plethora of accessories you can buy. 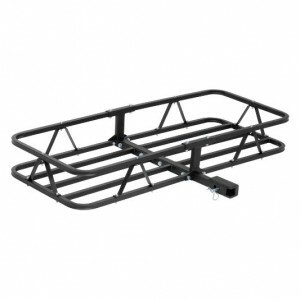 From our experience, probably the most popular hitch-mounted accessory is the bike rack. Let’s face it: folks love bike-riding, and being able to drive your bike to a different riding location expands your choice of locales. But the act of carrying the bikes can be so cumbersome. Do you put it inside the wagon? On the roof? What if you have multiple bikes to carry? 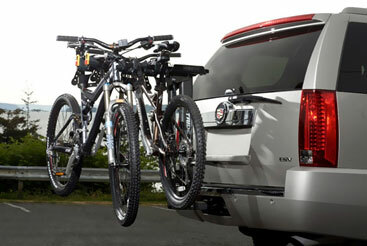 The hitch-mounted bike rack gives you the advantages of a low lift height, secure mounting, and 100% of your vehicle’s interior room. Some models carry 2 bikes; others can take up to 5, so be sure to check the details. 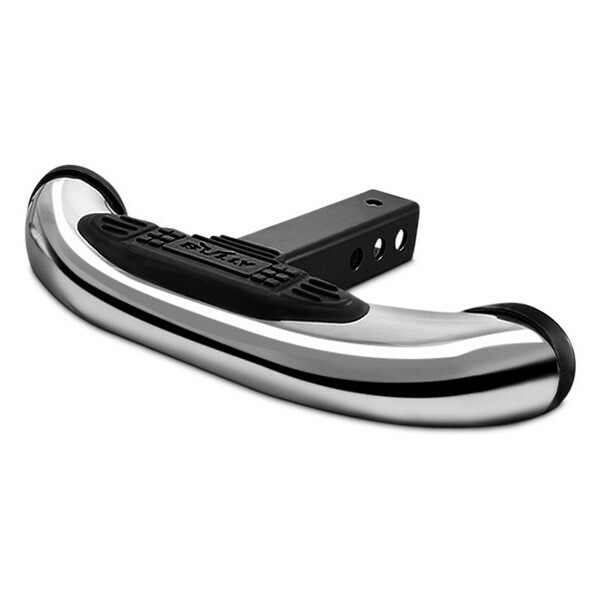 The deluxe ones include arms that swing the bikes out of the way, allowing you to open your tailgate without unloading the bikes. Winter sports more your thing? 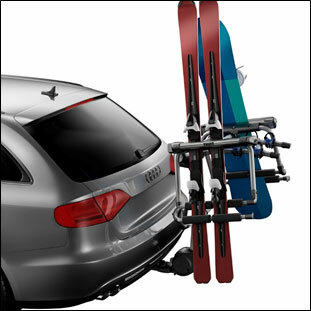 The skiers and snowboarders among you will be thrilled to know that you can purchase hitch-mounted carriers for these kinds of sports equipment. While the vehicle’s roof has been the more traditional carrying spot, your car may not accommodate a roof-mounted carrier, or you may be disinclined to reach up there all the time. Perhaps you need to occasionally carry more stuff than will fit in the back of the truck, and who doesn’t have more stuff these days? Cargo carriers in the form of trays, baskets, even boxes, can be mounted into the receiver hitch. If you have a family, with every seat taken inside the vehicle, sometimes all you need is “that little bit more” room, and these carriers fit the bill perfectly. (We have personally seen many modern 3-row SUVs which offer miniscule cargo holds behind the 3rd seat.) Like the sports equipment carriers, you gain the advantage of low lift-over compared to anything roof-mounted. These can easily be removed when not needed; some offer the option of a fold-up design which keeps them at-the-ready, but tucked out of the way when not being used. these are especially appreciated by those of us who are vertically challenged. 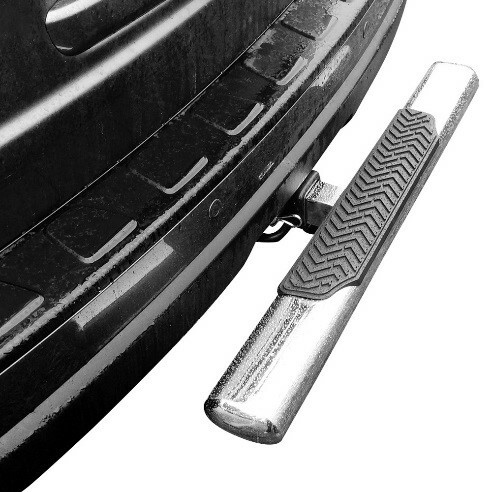 We know some owners who keep theirs in place year-round as additional parking lot protection (and a recent trip into NYC bore witness to over half the SUVs having this rear step left in place at all times). space. We think that once you’ve experienced how versatile they are, you will be looking for additional cargo-carrying accessories for your hitch. I’ve always had small cars, so I’m excited to be getting a new truck soon. I can’t wait to pick out a trailer hitch so I can haul whatever I like. I’m amazed by how many options there are available. 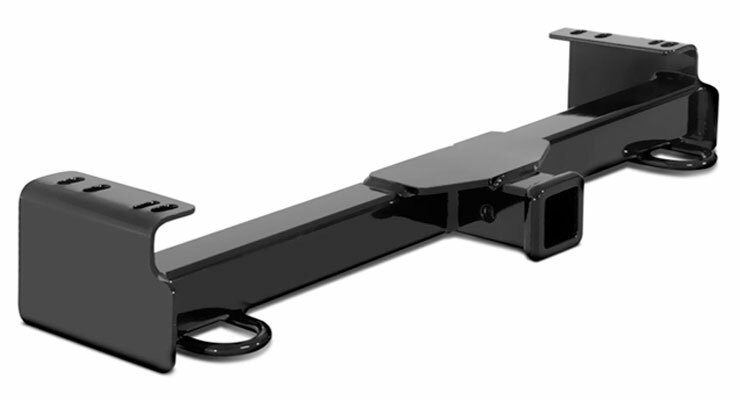 It seems like a receiver hitch is a good choice, because there are so many attachments you can choose to use with it. Switching between a bike rack and a rear step would be really useful. If I choose this style, can I still use the hitch to pull a trailer?